Texture refers to the surface characteristics of a material. Is it rough or smooth? Plush or gritty? Dimension (or depth) refers to the measurable extent to which something lifts off the page. 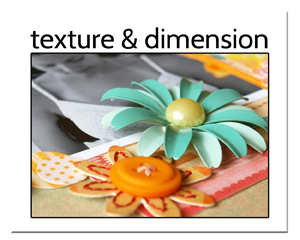 Real texture and dimension (as well as the illusion of texture and dimension) can be added to your scrapbook pages. Texture is a powerful art element because it can quickly evoke memories and emotions. Both texture and dimension can be used to engage the viewer’s sense of touch. The materials you use on a paper scrapbook page, for example: fabric, epoxy, lace, and textured cardstock, will add real physical texture. Doris Sander‘s “9 Years” is full of real texture, including rough glitter, string, textured cardstock, and smooth pearls and buttons. Rough surfaces reflect light unevenly. Smooth textures reflect light evenly. Matte surfaces reflect soft, dull light. Shiny surfaces reflect bright light. Understanding this, artists create visual texture by working with reflections of light, color, and values. Because lighter values appear to be closer and darker values tend to recede, combinations of the two side-by-side create the illusion of texture. On paper scrapbook pages, add visual texture with mists, certain patterned papers and digital effects. On digital scrapbook pages, many of the elements you’ll include are created with patterns of dark and light on a surface to provide the illusion of texture. “Their Everyday” is a digital page with visual texture that comes from purchased products AND digital techniques I added. The glass center to the flower is a digital element made by Katie Pertiet that adds the illusion of glass. I add a bit of subtle texture with a Photoshop Style to create the embossed scallops (at top right) and firefly trail (behind the title). Their Everyday by Debbie Hodge | Supplies: Chasing Fireflies Kit by Paislee Press; Before My Eyes Kit by Scrap Originals; Multi-layered Fotoblendz by Anna Aspnes; Oiselet Rouge Element Pack, Yellow Paper Alpha, Metal Alpha, Lil’ bits Alpha, Fall Fun Kit, Artistry de Blanco Element Pack by Katie Pertiet; Woodgrain Alpha by Crystal Wilkerson; Everyday Handdrawn Brushes by Ali Edwards; Wildflower Kit by Kathryn Wilson. Layer, stack, curl, and pop-dot your elements to achieve actual depth on your page. Outside by Michelle Clement (Masterful Scrapbook Design Texture & Dimension issue) | Supplies: Patterned Paper, Stickers, ‘Thickers’ Letter Stickers, Patchems, Flair, Leaf Embellishments, and Journaling Spot by American Crafts. Walnut Ink. Acrylic Paint. Masking Tape. Sewing Machine. Embroidery Thread. Fine Tip Pen. Pencil. Create the illusion of depth by manipulating shadows, light, scaling, overlaps, and perspective. Jana Morton says, “”I like to distort or angle elements to play with perspective and make it appear as if these elements have dimension and are sitting right in front of the viewer.” She used Photoshop perspective and shadowing techniques to do this on “5 Years.” Click here for her tutorial on this effect. Five Years by Jana Morton (Masterful Scrapbook Design Texture & Dimension issue) | Supplies: Anna Aspnes: ArtPlay Palette: Red, White and Blue, ArtPlay Palette Strawberry Preserve, Easy Torn Edges Layered Template No. 1, Heart LoopDaLoop Artstrokes No. 1. Maplebrook Studios: Jelly Alphabet No. 6. Katie Pertiet: Brushed Alphabet No. 3, Loosely Labeled Dates, Little Shores, Hinge Pack. Pattie Knox: Little Folded Ribbon Bits. Texture is a powerful art element because it can quickly evoke memories and emotions. Artists use both visual and physical textures to trigger your memories of previous texture experiences. This is a way for an artist to convey feelings about his or her subjects. What does velvet connote to you? Do worn wood, corduroy, or slate trigger memories? Travels by May Flaum. Travels | Supplies: Cardstock by American Crafts, inks by Tim Holtz, die cut paper by Basic Grey, embellishments from Vintage Findings kit by Making Memories, large letter by K&Co. Texture is tactile: it appeals to our sense of touch. It is an essential design element for visual artists, because it engages another sense in addition to sight. When you can incorporate texture on your pages, you draw your viewer in on another level. I loved being able to see the grain of the asphalt in the photos on “Rollin’.” When I look at the expanse of paved road, I recall the feel of asphalt passing beneath the skate wheels, as well as the sound the wheels make rolling over it. Rollin’ by Debbie Hodge | Supplies: Ransom Paper Pack by Vicki Stegall; Color 2 Labels by Crystal Wilkerson; Alpha and Number Set No 2 by Anna Aspnes; Junk Mail Alpha by Michelene Martin; Wonky Trims No 2 by Lauren Reid; La Belle Vie Kit by One Little Bird; Storyteller, Photobooth by Paislee Press; Ransom Journalers, Ransom Paper, Ransom Basics by Vicki Stegall; Just Juicy by Lynn Grieveson; From My Bookshelf No 4 by Katie Pertiet; Rock the Shadows Styles by Tracy Stroud. Texture and dimension, whether real or visual, are important tools for conveying the meaning of your page as well as actively engaging the viewer. The Masterful Scrapbook Design “Texture and Dimension” issue is full of ideas and how-tos from paper scrapbookers May Flaum, Michelle Clement, and Cindy Liebel, and digital scrapbookers, Peppermint Granberg and Jana Morton. The issue includes a 40+ page seminar, 5 video/audio interviews, 6 focused lesssons, and 2 annotated galleries. Click here. Thanks for some great idea’s I do love the look of the 5 years layout using perspective’s to add dimention. And as I have just brought Photoshop Elements 11, think I will have to have a play round Especially now I’m loaded with new idea’s So thanks very much for this great help..